From historian Stephen Alford, author of The Watchers, the dramatic story of the dazzling growth of London in the sixteenth century. For most, England in the sixteenth century was the era of the Tudors, from Henry VII and VIII to Elizabeth I. But as their dramas played out at court, England was being transformed economically by the astonishing discoveries of the New World and of direct sea routes to Asia. At the start of the century, England was hardly involved in the wider world and London remained a gloomy, introverted medieval city. But as the century progressed something extraordinary happened, which placed London at the center of the world stage forever. 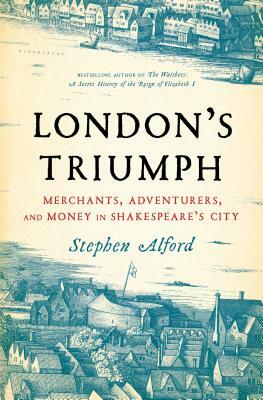 Stephen Alford’s evocative, original new book uses the same skills that made his widely-praised The Watchers so successful, bringing to life the network of merchants, visionaries, crooks, and sailors who changed London and England forever. In an explosion of energy, English ships were suddenly found all over the world--trading with Russia and the Levant, exploring Virginia and the Arctic, and fanning out across the Indian Ocean. The people who made this possible--the families, the guild members, the money-men who were willing to risk huge sums and sometimes their own lives in pursuit of the rare, exotic, and desirable--are as interesting as any of those at court. Their ambitions fueled a new view of the world--initiating a long era of trade and empire, the consequences of which still resonate today. Stephen Alford is the author of the highly acclaimed The Watchers: A Secret History of the Reign of Elizabeth and a fellow of the Royal Historical Society. He taught for fifteen years at Cambridge University, where he was a senior lecturer in the faculty of history and a fellow of King's College. He is now professor of early modern British history at the University of Leeds.